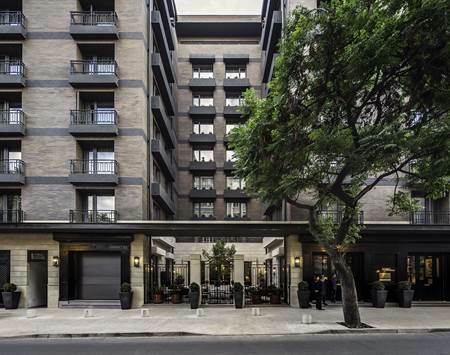 Built to blend seamlessly into the neighborhood of Lastarria, the five-star Singular Santiago combines the style of early 20th century buildings with neoclassical French architectural influences. The result is a striking addition to the Santiago cityscape. The hotel's design embraces the artistic heritage of the neighborhood, while adding a cutting-edge modernity: it is an innovative homage to the city's history and culture. The interior of the hotel recalls the days of yore: a tribute to the palaces of past centuries that sets the tone for the entire environment. Each doorway is a portal not just into another room, but to another place: a Singular setting with an ambiance all its own. Everywhere one goes in this Santiago hotel, they will experience yet another pleasant surprise. The endlessly indulgent spa. The superlative dining experience at the Singular Restaurant. The dazzling views and refreshing cocktails in the ninth floor Singular rooftop bar. Step out onto the elevated terrace, and one is treated to a spectacular view: the Parque Forestal, an arboreal escape right alongside the hotel. And while on the roof, enjoy the rooftop swimming pool. The hotel is not only bounded by natural beauty - Lastarria is the epicenter of the arts in Santiago. Walk just a few minutes, and one can discover some of the finest visual and performance art Chile has to offer at The Museum of Fine Arts, The Museum of Visual Arts, The Gabriela Mistral Center and more. The rooms and suite at The Singular Santiago are an alluring blend of classic and contemporary, offering modern comforts while exuding the charm of a bygone era. Though the hotel is brand new, rooms have an air of classic comfort. Tasteful touches, rich wood, supple leather, different color schemes and soft lighting create a warm, welcoming environment within which to unwind after a day conducting business or exploring the city. Every one of the 62 rooms offers a safe-deposit box, refrigerator with soft drinks, and Wi-Fi. The seven Patio rooms have a western orientation and are 269 square feet in size. The 14 Classic rooms have a southern orientation and are 301 square feet in size. The 40 Singular Rooms have a northern orientation and are between 388 square feet and 431 square feet in size, each having a separate shower and bathtub. The Singular Suite is exquisite and expansive, having a northern orientation with a capacity of 861 square feet including a separate living room area and a double vanity bathroom. No matter which room one chooses at The Singular Santiago, the level of comfort and service is among the best in South America.